OOOOOO CANADAAAAAA!!! Just kidding. Although I have found a surprising amount of really nice Canadian TV recently: Murdoch Mysteries, Lost Girl, Heartland, Continuum…but I digress. Now come on, what about that picture doesn’t look AWESOME? IMDB Synopsis: In the late 1890s, police Inspector William Murdoch takes a new, more scientific approach to solving crimes. Assisted by coroner Dr. Julia Ogden and Constable George Crabtree, Murdoch introduces such concepts as finger marks and lie detecting machines. He has the support of his somewhat doubtful superior, Inspector Brackenreid, though at times, even he finds Murdoch’s methods – and claims – somewhat astounding. I discovered this lovely little Canadian show a few months ago on a long weekend break. I flew through the three seasons available on Netflix and went in search of the rest of the seasons, pleased to find that a new season (season 7) is airing this fall. Thrilled is probably a better word. This show is pretty much CSI set in the 1890’s. Murdoch is a man ahead of his time, reading anything and everything, learning scientific techniques that other constables find ridiculous and a waste of time. Murdoch frequently gets this look when less intelligent people are around, which is pretty much always. He generally tries to explain things and people almost never understand. Especially not his superior, Inspector Brackenreid, although he, over time, becomes very supportive of Murdoch as he sees his unquestionable value to the Constabulary. Murdoch’s sensibilities are also offended or surprised on a regular basis, which is frequently quite adorable. And refreshing, to be honest. I love Murdoch because he is the perfect gentleman. He is hungry for knowledge, and he cares about justice, not just closing a case. He will find the truth, no matter where that takes him. One thing I ADORE about this show is the constant conflict between Murdoch’s job and his faith. He’s a Roman Catholic, and that many times causes a problem when he’s investigating. You see much of his work through that worldview, therefore seeing his compassion, and at times, righteous anger. It is a very important plot point, not something that goes away after a few episodes. It adds a very interesting level of character development, not just for Murdoch, but for his love interest, Dr. Julia Ogden. Oh Dr. Ogden. Beautiful, brilliant, and completely unreasonable. I have a love/hate relationship with Julia. She manages to frustrate me almost every episode, but I still like her. ANYWAY. The Comedic relief is none other than the illustrious George Crabtree. I thought he was going to annoy the crap out of me when I started this show, but he turned out to be one of my favorite characters. He’ll surprise you. 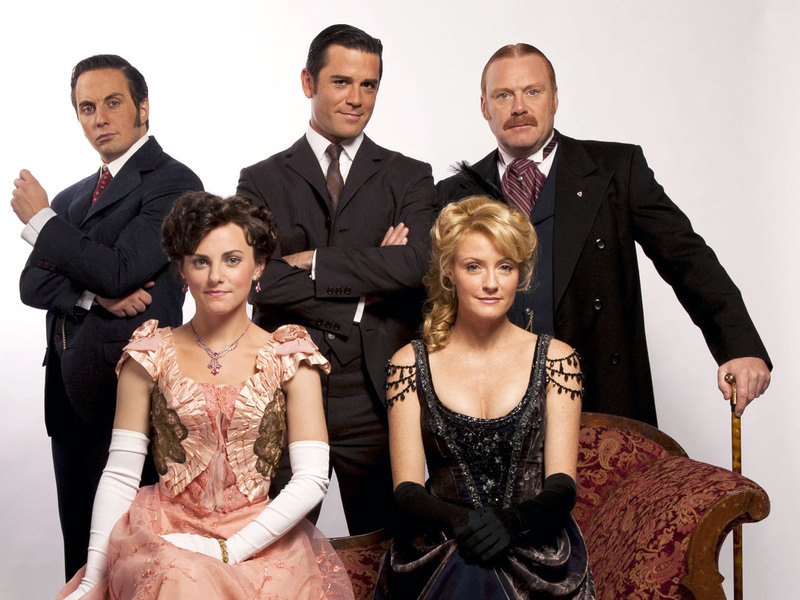 Mainly episodic, Murdoch Mysteries has guest appearances from history, such as William Churchill, Sir Arthur Conan Doyle, and Nicola Tesla. Really a fun and pleasant watch, with lots of good acting and clever writing. And of course, the costumes are lovely. A great show for fans of Downton Abbey or most period BBC shows. This entry was posted in TV Show Reviews.